This Scottish black bun recipe will serve 12 - 16 people and is a traditional treat served on Hogmanay and over the New Year festivities. It is a rich, moist, fruit cake baked in a pastry crust. A sign of a well made Black Bun is that it should stick to the knife as it is cut. In olden days sweetmeat Black Bun cake slices would have been served on Twelfth Night. 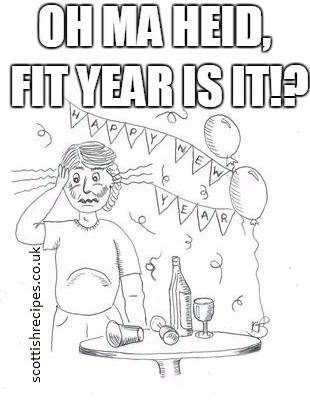 It then became a Scottish New Year delicacy and treat. This recipe for Black Bun should be made a few weeks before New Year's Eve so that the fruits absorb the alcohol and it matures to full flavour. It will, like a Christmas cake or Christmas pudding, keep in an airtight container or tin until eaten. Though in the Maw Broon's Cookbook she recommends making it several months before eating it. The book Scots Cooking: The Best Traditional and Contemporary Scottish Recipes by Sue Lawrence describes how it was supposed to have been the original Twelfth Night cake eaten in Scotland. It was then later known as Scotch Christmas Bun before becoming known as Black Bun. This easy black bun recipe should get your New Year celebrations off to a great start and also makes a great treat for Scots on Burn's Night and St Andrews Night. 1.Sieve the flour and the salt. 2. Rub in the butter and then mix in the water. The dough should start to become stiff. 3. On a pastry board roll out the mixture into a thin square. Set aside and make the filling. 1.To make the filling for Blackbun you should first grease two 2lb loaf tins or a large tin. 2. Sieve the flour and mix in the sugar, ground almonds, mixed spice, cinnamon, ground ginger, cayenne pepper, baking soda and the cream of tartar. 3. Now stir in the dried fruits of currants, raisins, sultanas, candied peel and the chopped almonds. 4. Gently fold in the beaten eggs and the buttermilk until the mixture becomes soft and moist. 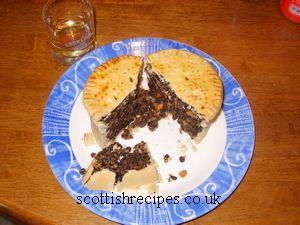 Another Black Bun recipe can be read in the new book Maw Broon's But An' Ben Cookbook . 6. 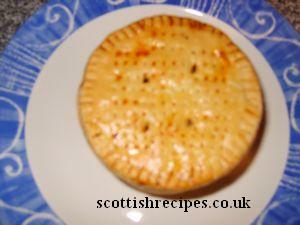 Use about two thirds of the pastry to line the tins. If the pastry has to be joined then wet these so that a good seal is formed. 7. Put the mixture into the tin, on top of the pastry. Make sure it is packed firmly and then level off. 8. Brush the top of the fruit mixture with the white of the egg. 9. Cover this top with the remaining pastry and seal the edges. 10. Brush the visible pastry, ie the top, with a beaten egg or some milk. 11. Prick the black bun with a knitting needle from the top all the way to the bottom so that any trapped air can escape through this hole, rather than burst through during cooking. 12. Pinch around the edges to give a nice finish. 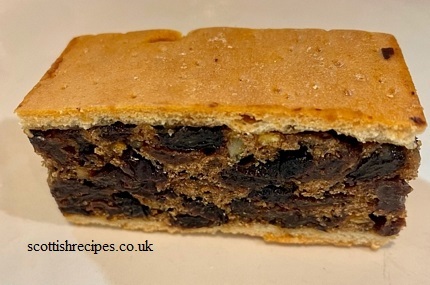 Delia's Happy Christmas has a recipe for black bun in which she describes the bun being the Scots term for plum cake. 13. Bake in a low pre heated oven at 300F, gas mark 2 or 150C for about two and a half hours. 14. To prevent the bun turning brown too quickly cover with kitchen foil or brown paper at any time during the cooking. 15. Remove from the oven and set aside to cool down. 16. Turn out from the tin and store in an airtight container until ready to eat. 17. Serve with a fine malt whisky and a Happy New Year! 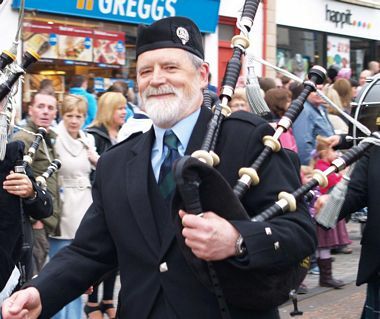 I am a fan of Black Bun, it was the taste on New Year for me when I was a lad in Edinburgh during the 50s. I inherited my mother's old Lofty Peak cook book which is the recipe that she used. For me the key spice is Allspice, aka Jamaica Pepper. That and finely ground black pepper, not from a hand grinder but the fine dust that you get from the little containers with pre-ground black (and white) pepper. These don't feature in the recipe on your site. Also an important part is the very short thin pastry; some of the shop bought ones has an almost cakey pastry which is just not right in my humble opinion. 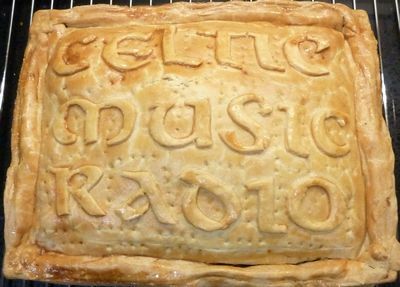 I have put some information on a Facebook page with a copy of the recipe and some photos to help with making this true Scottish delight. I think that it is an east coast thing and it hasn't gained recognition in the west and therefore hasn't received the recognition that it deserves. A Happy New Year to a�body an lang may yer lum reek!